Come to Conversation Club at International House Philadelphia twice monthly. Whether you are looking to improve your Japanese or your English, or just talk about Japan-related topics, everyone is welcome! Join us at the Satell Study Center on the second floor of International House Philadelphia, and feel free to bring beverages or snacks. 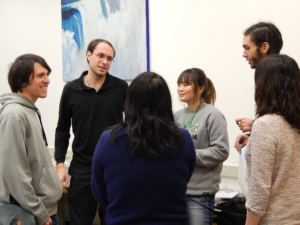 Conversation Club is open to English and Japanese speakers of all levels. No RSVP is required.